Our school is guided by our motto, ‘Believe, Strive and Achieve’. 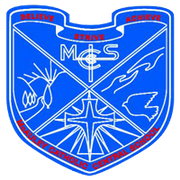 In accepting placement at McAuley Catholic Central School, the students undertake the responsibility of aiming to fulfil their potential by giving their best in everything they do with the assistance and support from our wonderful teachers. A student leaving McAuley Catholic Central School at the end of Year 10 is equipped with the knowledge, skills, understandings and values necessary to experience life-long relationships with God, each other and the world around them. Whilst being a relatively small school, the opportunities provided by McAuley are quite extensive due to the different methods of delivery and the creativity of our staff. In line with our Quality Teaching Framework focus, all staff are integrating and updating ICT as a regular strategy across many of the curriculum areas. People familiar with Tumut will understand the significance of water to this region – the beautiful flowing river, the life-giving source of nourishment and life. The symbol of the river is a sign of God’s faithful love flowing in and through one another. It is symbolic of the life-long journey we are all on – a journey that is always filled with hope and a forward thinking mindset. We welcome enrolments from families genuinely interested in the education and values taught from the perspective of the Catholic Tradition. I look forward to welcoming you personally to our School.